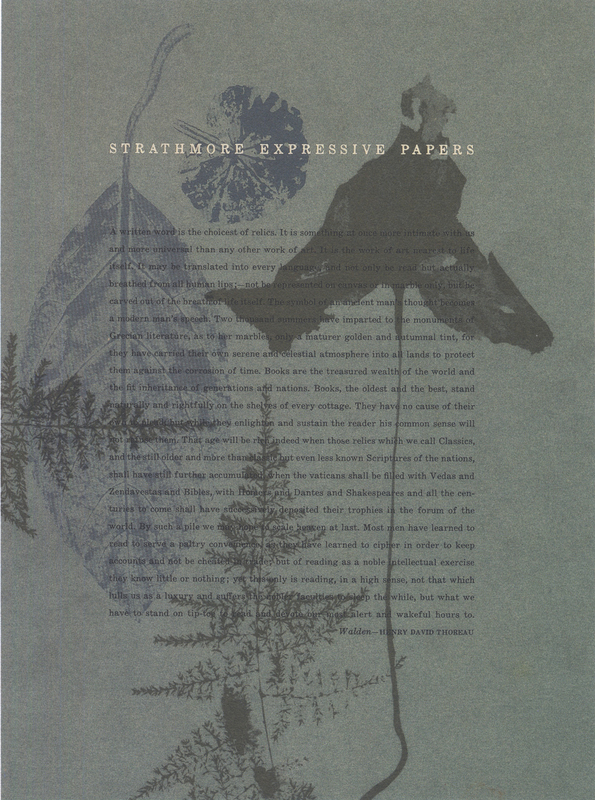 In 1950 the Strathmore Expressive Papers for Letterheads portfolio by Rudolph Ruzicka inaugurated a new series of promotions by Strathmore created by design luminaries. The famous designer series was the brainchild of Harry E. Riggs (b. 1892), Strathmore’s advertising manager and vice-president for sales. It represented a shift from the emphasis in the 1920s on famous artists which reflected an ongoing shift in the profession from commercial art to graphic design. 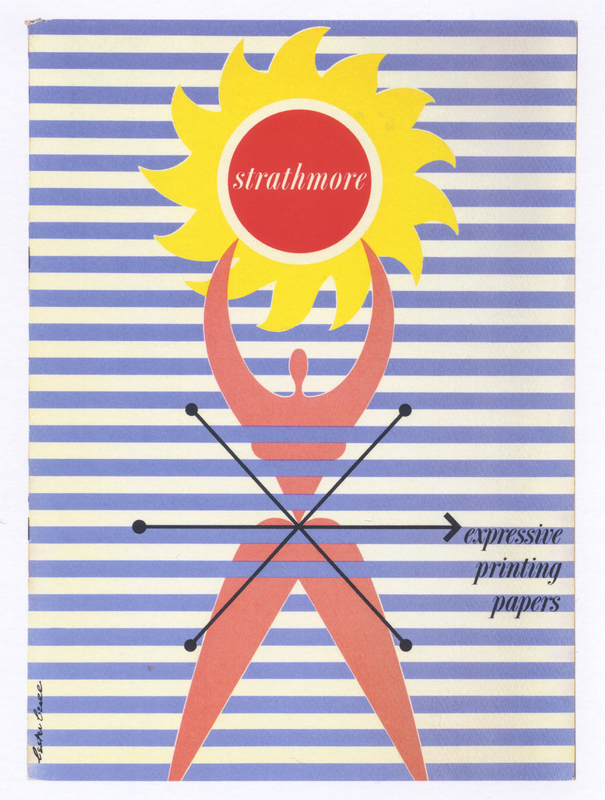 With the exception of Ruzicka and Will Bradley, the contributors to the series, which carried the tagline “Strathmore Expressive Printing Papers,” were all modernists, insuring that Strathmore was aesthetically up-to-date. Among them were Lester Beall (1903–1969), Will Burtin (1908–1972) and Saul Bass (1920–1996). 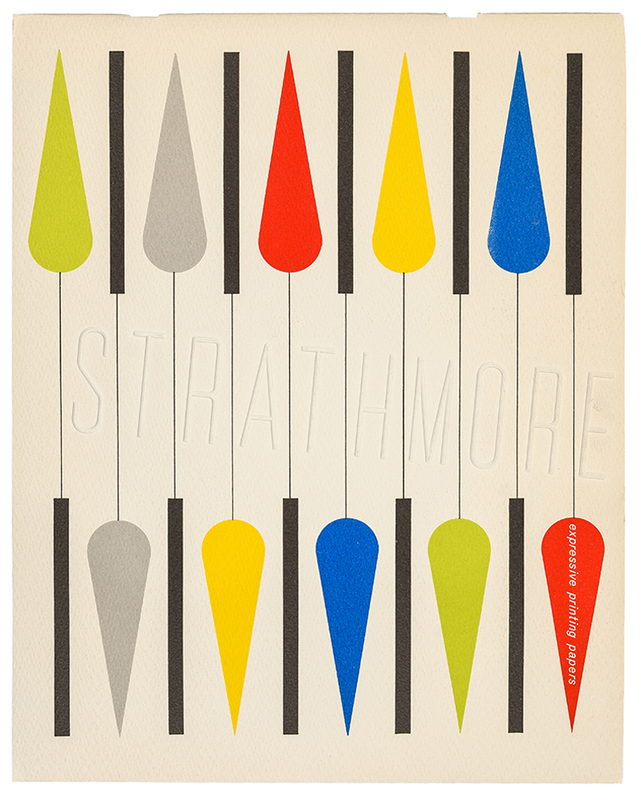 Ironically, the most celebrated (and complex) portfolio in the series, and the culmination of Strathmore’s postwar rebuilding efforts, was by the 86-year old Bradley in 1954. It contained twenty-nine separate designs. After Ruzicka, the famous designer series kicked off with Lester Beall whose portfolio was the largest of them all at 11 x 15 1/4 inches in size. Its design with a large biomorphic figure holding the sun aloft against a striped background was a dramatic departure from the sedate pre-war style of Cleland, Dwiggins, Teague et al that had characterized Strathmore’s famous artist series. The horizontal stripes were a reminder of the series of ground-breaking posters Beall had designed in the late 1930s for the Rural Electrification Administration. With its variety of differently sized inserts Beall’s portfolio set the tone for those that followed. 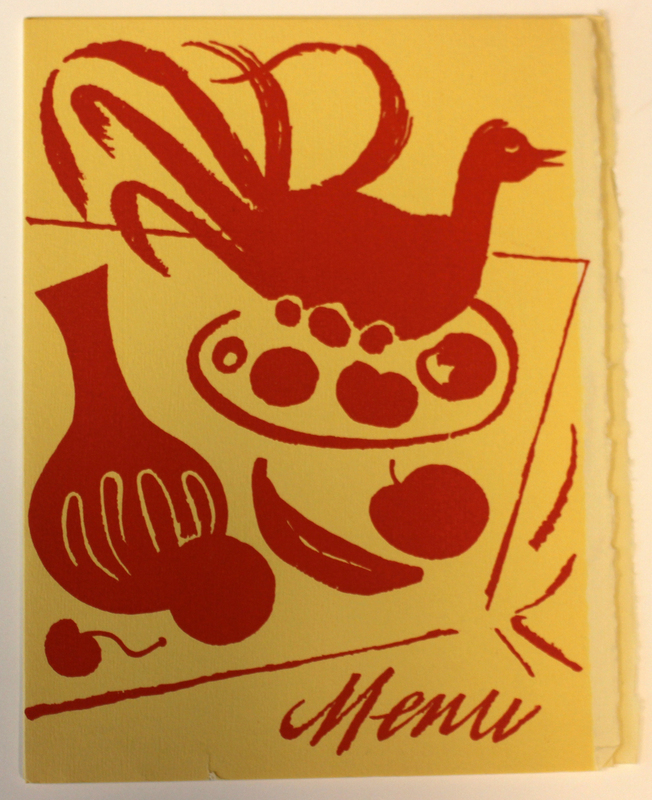 Menu insert from Strathmore expressive printing papers portfolio (Strathmore Paper Co., 1950). Design by Lester Beall. Strathmore Expressive Printing Papers portfolio (Strathmore Paper Co., 1957). Design by Noel Martin. Photograph by Vincent Giordano. 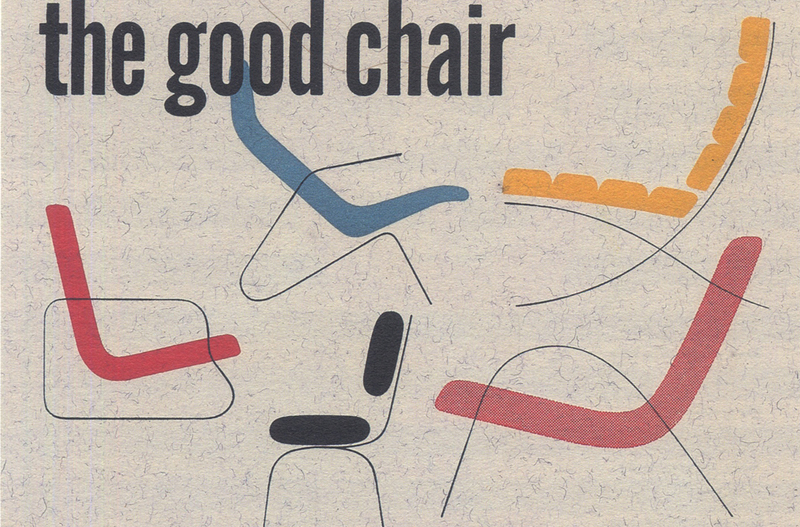 “the good chair” sample design from Strathmore Expressive Printing Papers portfolio (Strathmore Paper Co., 1952). Design by Will Burtin. From The Strathmore Century: The 100th Anniverary Issue of The Strathmorean by Mill Roseman (Westfield, Massachusetts: Strathmore Paper, 1992). The portfolios by both Burtin and Martin were both wire-bound with inserts tipped onto the pages inside. Burtin’s was noteworthy for a concentric die-cut hole that penetrated the entire binder to showcase the full color range of Strathmore papers, while Martin’s was distinguished by a photogram of leaves and flowers on its cover. (Bass had used similar imagery on his portfolio cover the year before.) Samerjan’s portfolio includes more elaborate inserts, one with a pull tab and another with translucent paper and a die-cut. The paper engineering was a new way for Strathmore to demonstrate that paper was part of the picture. Strathmore Expressive Printing Papers portfolio (Strathmore Paper Co., 1956). Design by George Samerjan. Photograph by Vincent Giordano. 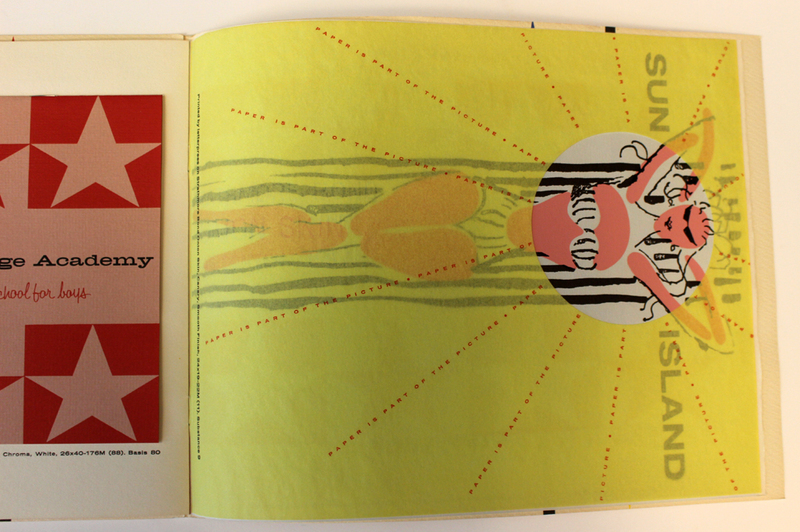 Spread from Strathmore Expressive Printing Papers portfolio (Strathmore Paper Co., 1956). Design by George Samerjan. Page from Strathmore Expressive Printing Papers portfolio (Strathmore Paper Co., 1956). Design by George Samarjan. As can best be determined, the famous designer series came to an end in the early 1960s. It may have been the victim of corporate change. In 1961 Hammermill Paper Company of Erie, Pennsylvania agreed to buy Strathmore Paper. When the acquisition was completed the following year, it marked the end of the Strathmore Paper Company’s independence after seventy years. Fortunately, its paper promotions continued to be innovative in the decade that followed. *I would like to thank Alex Tochilovsky of the Herb Lubalin Study Center of Design and Typography at Cooper Union for loaning the Burtin portfolio to the Paper Is Part of the Paper exhibition at The Opalka Gallery; and Greg D’Onofrio and Patricia Belen of This Is Display for loaning the Noel Martin portfolio. If anyone has copies of either of these portfolios or those by van Bellen, Piening, Bass, Low, or Fujita, Mohawk would be interested in acquiring them. The images shown below from the Piening and Bass portfolios are reproduced from The Strathmore Century: The 100th Anniversary Issue of The Strathmorean by Mill Roseman (Westfield, Massachusetts: Strathmore Paper, 1992), a book published to celebrate the centennial of Strathmore Paper. Since they were not original artifacts they were not included in the Paper Is Part of the Picture exhibition. 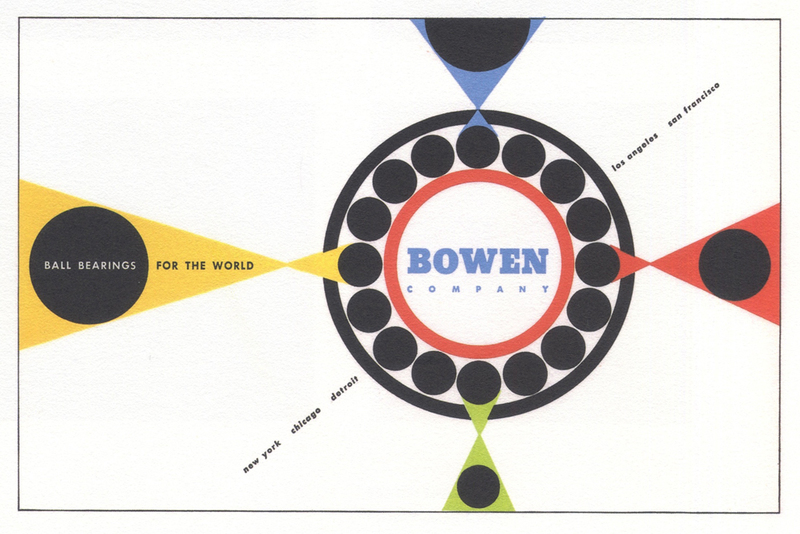 Bowen Company sample design from Strathmore Expressive Printing Papers (Strathmore Paper Co., 1953). Design by Peter Piening. From The Strathmore Century: The 100th Anniversary Issue of The Strathmorean by Mill Roseman (Westfield, Massachusetts: Strathmore Paper, 1992). 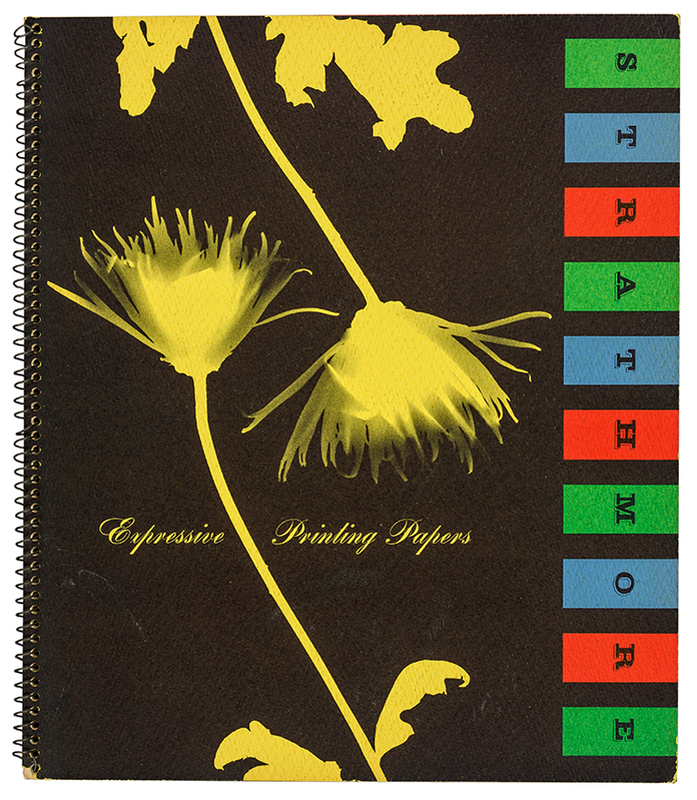 Strathmore Expressive Printing Papers portfolio (Strathmore Paper Co., 1956). Design by Saul Bass. From The Strathmore Century: The 100th Anniverary Issue of The Strathmorean by Mill Roseman (Westfield, Massachusetts: Strathmore Paper, 1992).